Ennai kathirikkai kuzhambu is an Authentic South Indian Spicy gravy. Baby brinjal is stuffed with spice powders, then cooked with tamarind Gravy. This is a very popular dish from the south Indian cuisine especially in Tamilnadu. 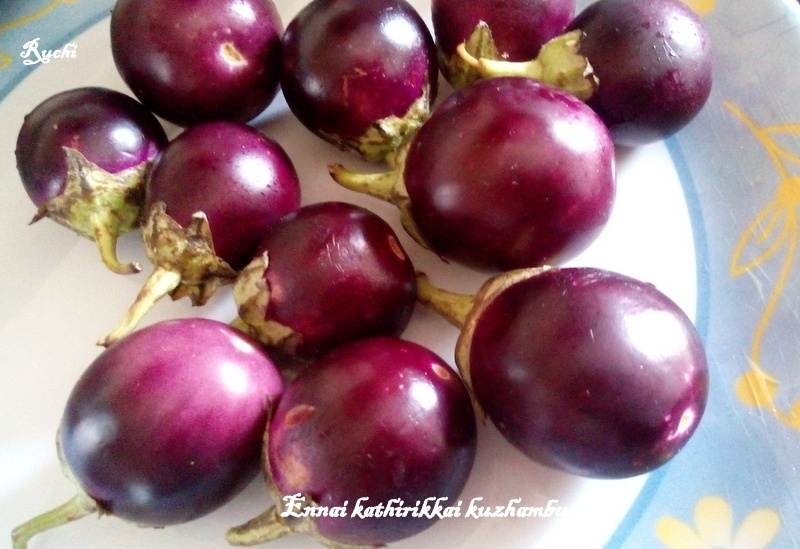 Whenever I get baby brinjals in the market, I am tempted to make this kuzhambu. I often make this kuzhambhu but never post it.It is a comfort food and my family’s favorite. It tastes awesome with rice and also with dosa &idli. 2.Heat a tsp of oil in a kadai and fry the ingredients mentioned under 'roast and grind' until dal turns golden brown. Then grind it to a semi fine powder.Set aside. 3.Wash baby brinjals, discard the stem and make a + cut leaving the bottom intact. Now stuffall the brinjals with the spice powder. Reserve the remaining spice powder for the kuzhambu. 4.In a pan add sesame oil - add mustard seeds let it splutter then add small onions, curry leaves, and hing allow it slightly brown. Then add the stuffed brinjals and saute on low flame. 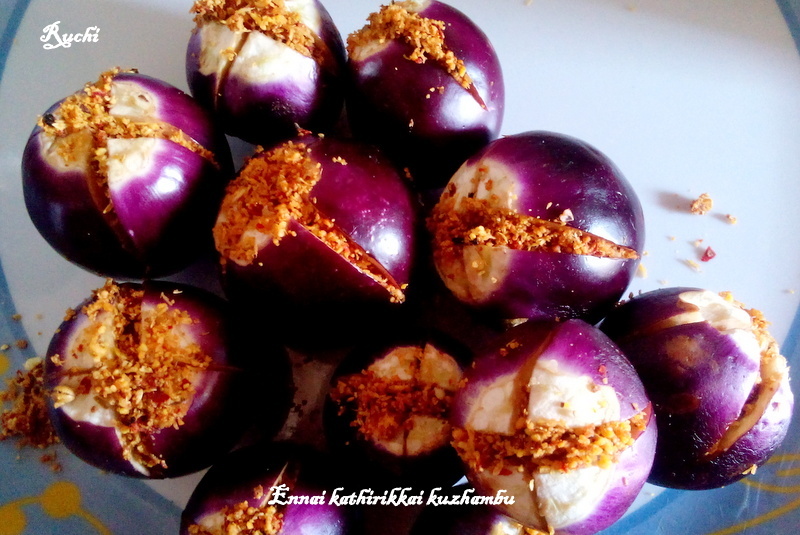 5.When brinjals are half cooked add the tamarind extract, Then add thesalt, spice powder, turmeric and sambar powder. Add 1/4 cup water if it becomes thick. 6.Cook on medium flame until the gravy thickens slightly and oil floats on the top. 7.Delicious Ennai kathirikai Kulambu is ready to be served with hot steamed rice.